A man walks past palm trees lining the corniche promenade in Dhahran, Saudi Arabia, on Thursday, Oct. 4, 2018. Futures in New York climbed as much as 1.9 percent after posting the biggest weekly loss since May. 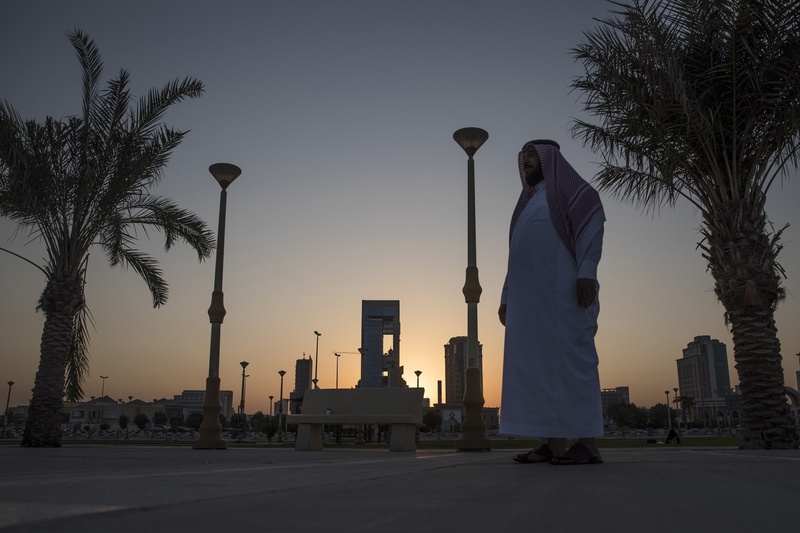 The Saudi foreign ministry said the kingdom “will respond to any measure against it with an even stronger measure,” which could be read as a veiled threat to use its energy riches as a political tool. The warning came after President Donald Trump pledged “ severe punishment” should Saudi Arabia be linked to Khashoggi’s disappearance. If Saudi Arabia does use its crude resources to hit back, it would be a break from its decades-old policy of putting petroleum above politics. During a recent diplomatic spat with Canada, state-owned producer Aramco continued to supply a refinery in the North American nation even though Riyadh severed most other economic links. The kingdom had used energy as a weapon when it led an oil embargo in 1973-1974 during a war between Israel and a coalition of Arab states. West Texas Intermediate for November delivery rose as much as $1.36 to $72.70 a barrel on the New York Mercantile Exchange, and was at $72.19 at 10:54 a.m. in Seoul. The contract slid 4 percent to $71.34 last week. Total volume traded was about 54 percent above the 100-day average. Brent for December settlement climbed as much as $1.49, or 1.9 percent, to $81.92 a barrel on the London-based ICE Futures Europe exchange. Prices declined 4.4 percent to $80.43 last week, the biggest weekly drop since early April. The global benchmark crude traded at a $9.49 premium to WTI for the same month. Khashoggi hasn’t been seen since he entered the Saudi consulate in Istanbul on Oct. 2. The U.S. administration is said to increasingly regard the kingdom’s denial of any involvement of his disappearance as untenable. Turkish officials say they have audio and video recordings showing a Saudi security team detained the journalist before killing him and dismembering his body, according to the the Washington Post. As the world’s biggest oil exporter and the de-facto leader of the Organization of Petroleum Exporting Countries, Saudi Arabia’s role has become even more crucial at a time when the market awaits other key producers to step in to make up for lost barrels from Iran to Venezuela. The kingdom’s threats mark a surprising turn in the otherwise warm relationship between Trump and Saudi Crown Prince Mohammed bin Salman. While Trump is reluctant to cancel multimillion-dollar arms sales to Saudi Arabia out of concern the U.S. ally will turn to Russia or China instead, a range of other punishments are under discussion within the administration, including downgrading diplomatic relations to sanctioning Saudi officials. Turki Al Dakhil, who heads the Saudi state-owned Arabiya news network, wrote in an article that U.S. sanctions against Saudi Arabia could wreak havoc on the global economy by taking oil prices to $200 a barrel and more. Faisal bin Farhan, a senior adviser to the Saudi embassy in Washington, said on Twitter that these comments don’t represent the Saudi leadership. Other oil-market news: In the U.S., working oil rigs rose by eight to 869 last week, the highest since mid-August, according to data released Friday by oilfield services provider Baker Hughes. Money managers trimmed wagers on rising WTI crude prices to an eleven-month low ahead of an equities rout that sent commodities tumbling. A lack of protection and security at Libya’s Zawiya refinery might affect operations and even lead to a complete halt, the country’s National Oil Corp. said in a statement.